Last summer, while at the Quail — one of the ancillary events surrounding the Pebble Beach Concours d'Elegance — we ran across an Alpine A110. We tell you what, this car in full racing regailia is one of the most awesomely fierce-looking 1970s rally vehicles this side of the deluxe-war-baby Lancia Stratos. And indeed, the Stratos is the car that ended its reign. Interestingly, the car didn't truly peak in motorsport until a decade after its introduction in 1961. 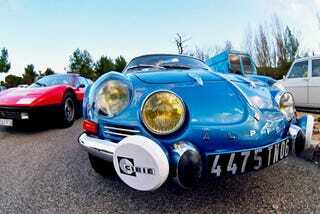 Sadly, today, Lancias are generally rather ungainly and Alpine has been fully absorbed into Renault. But just look at this thing. The last time we saw a Frenchman this angry, his girlfriend of close to a year had just told him she had herpes. If it's not a call for a return to glorious, holy petrol-high madness, what is? Renault R5 Turbo on eBay!